Before we get to Card #10, the winner of yesterdays daily giveaway is: Mary Jane who said, “Beautiful!”. Thank you for your kind words and Congratulations Mary Jane! I hope you enjoy your card. Don’t forget to leave a comment on this post for today’s card. 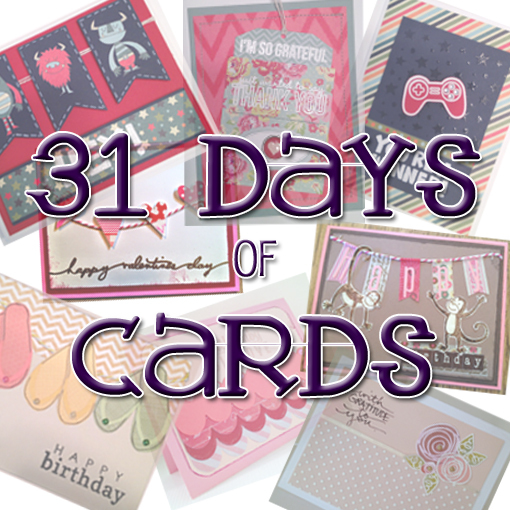 Remember each day you leave a comment, you are entered into the drawing for the Grand Giveaway for all 31 cards. Easy, peasy. I started by assembling all my supplies. Today’s card is dedicated to all my friends and dear readers who own cats. 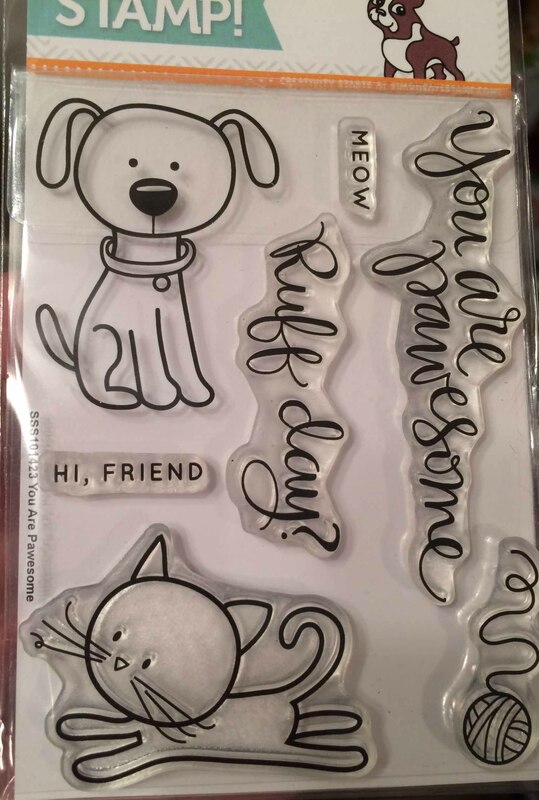 This stamp is part the the same set that I used on Card #6 – Ruff Day? I was obviously attracted to this set because of the dog, but the ball of yarn called to me as well ;-). I used white cardstock (5 1/2″ X 8 1/2″) for my base, orange cardstock (5″ X 3 3/4″) for the frame and patterned cardstock (4 3/4″ X 3 1/2″) for the design. I started by die cutting the patterned cardstock using a rectangular stitched die. 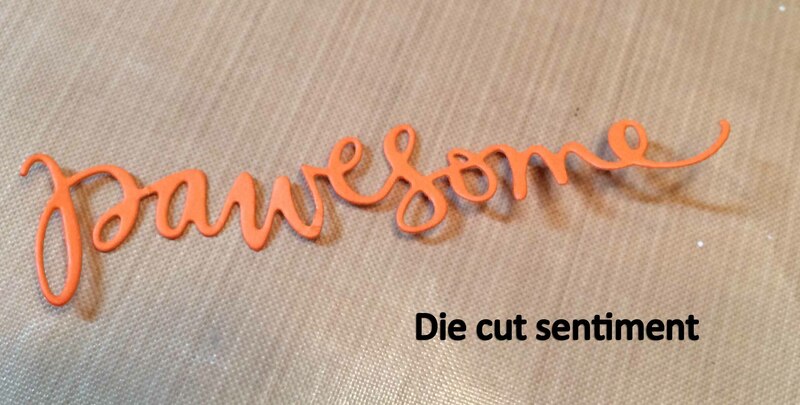 I also die cut the sentiment “Pawesome” out of orange cardstock. 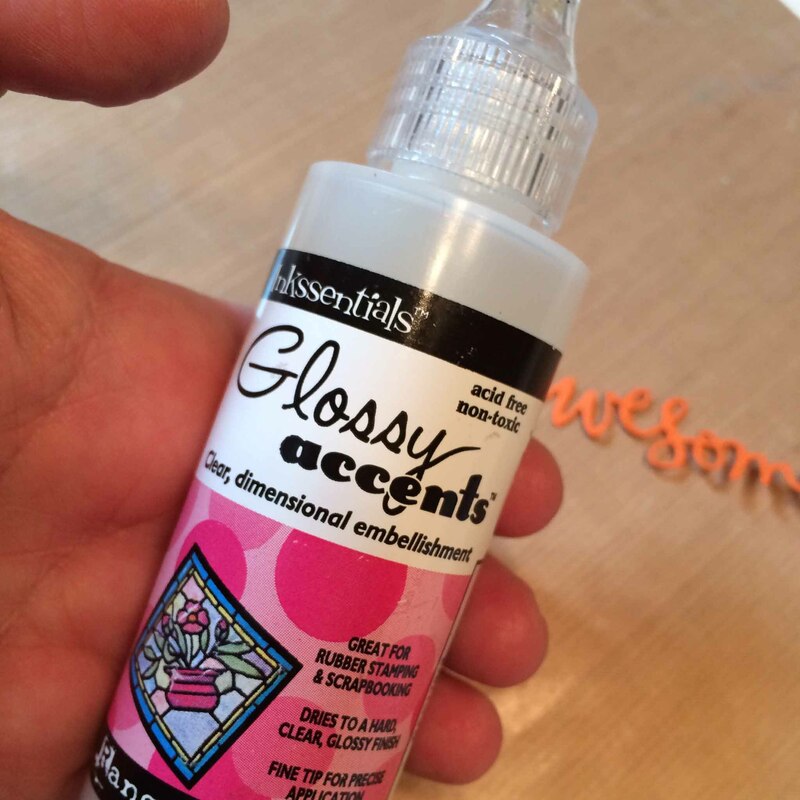 I wanted to add some dimension and glamor to the sentiment so I went over the letters with Glossy Accents, a clear, dimensional adhesive and glitter. I found some scrap white cardstock and stamped, in black ink, the cat and the ball of yarn. 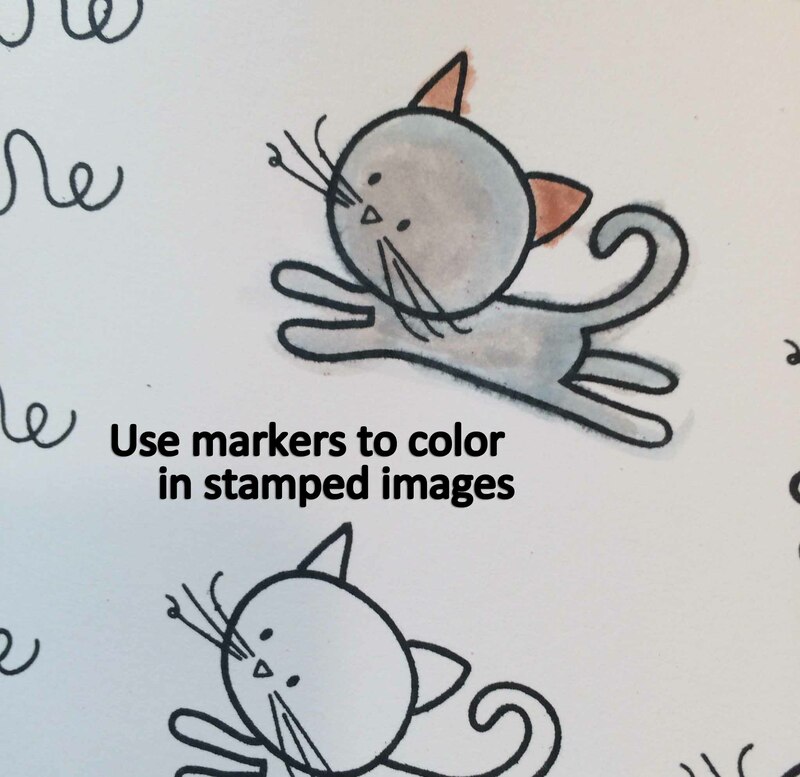 I colored the images, cut them out and went around the edges with a black marker to give the pieces a finished look. 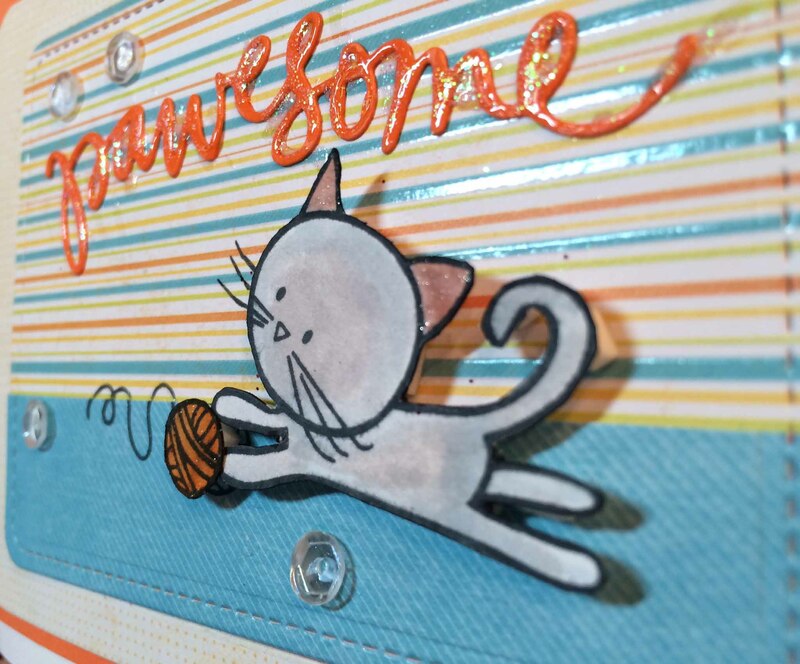 I then glued the sentiment and stamped the ball of yarn on the patterned cardstock. 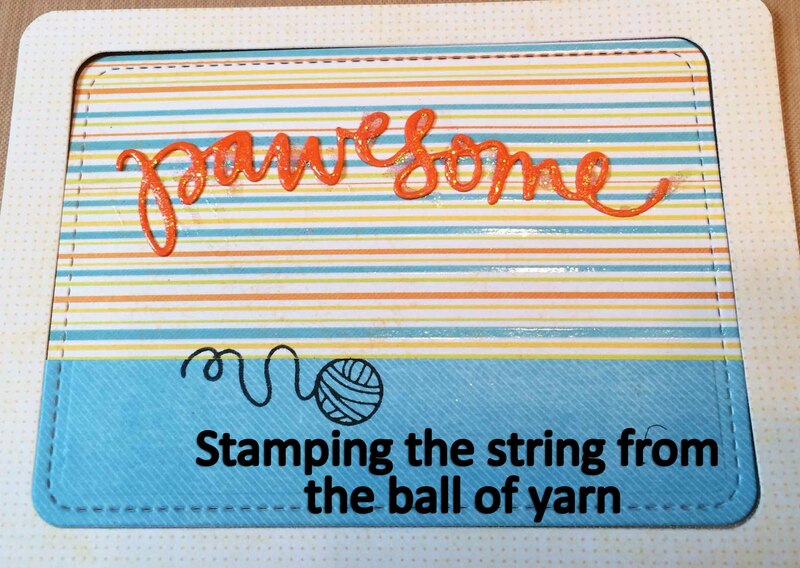 I stamped the ball of yarn because I cut off the string after I colored the yarn image. 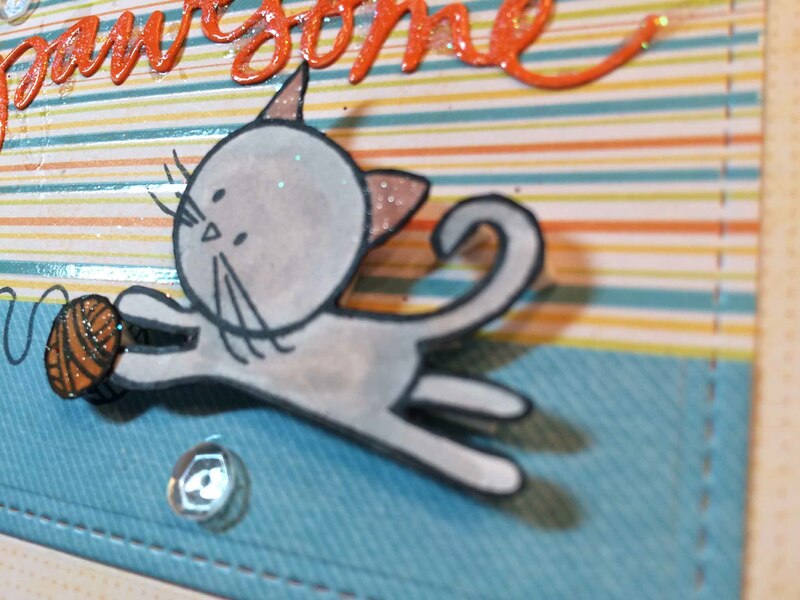 I added foam squares to the back of the cat and the ball of yarn and attached them to the patterned cardstock. I used my tape runner to adhere the frame to the orange cardstock. I then glued the patterned cardstock inside the frame. 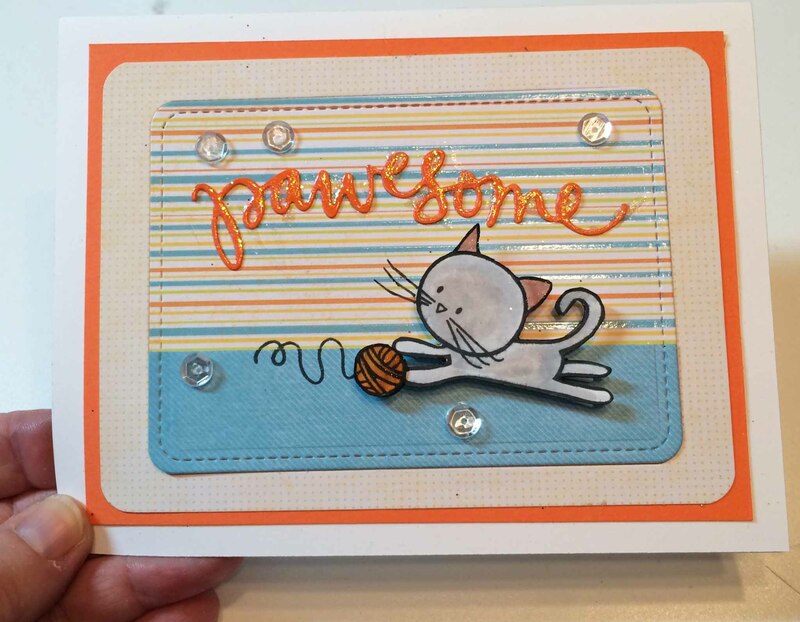 I finished the card by attaching the front to the white cardstock base and adding a few sequins. 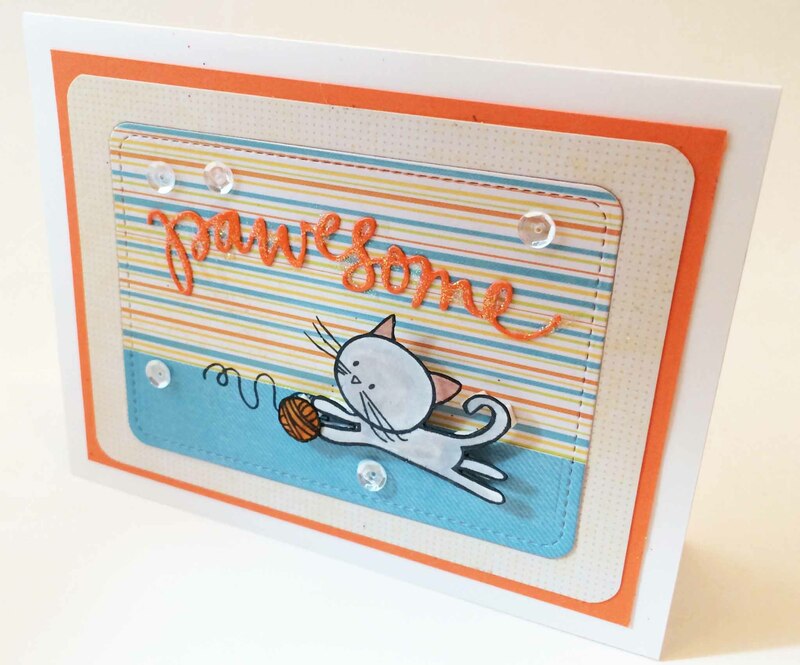 Remember to leave a comment below and be entered to win this card today and possibly the Grand Giveaway of all 31 cards on February 1, 2015. 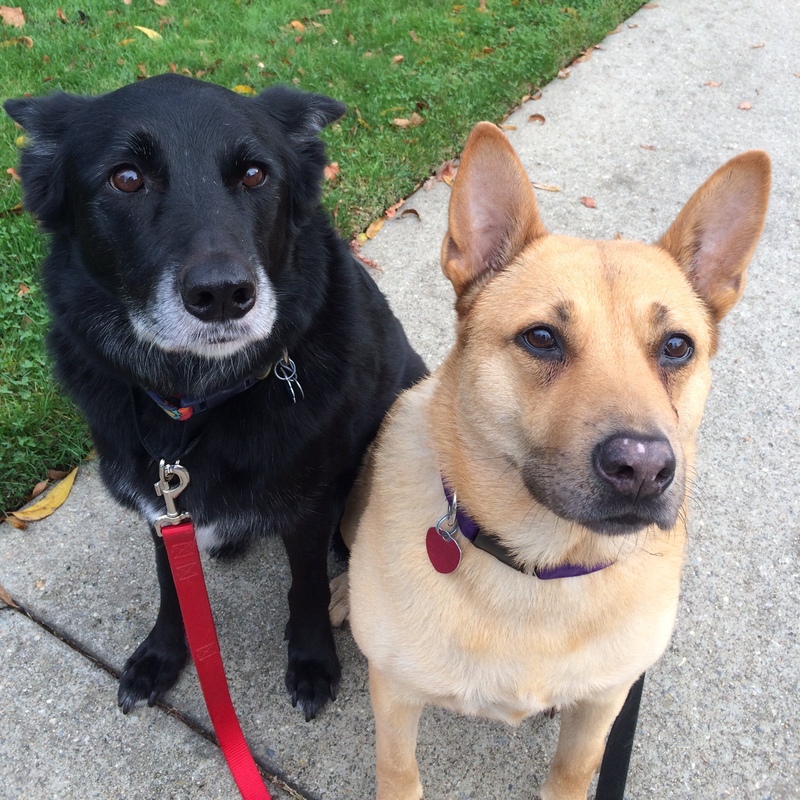 Are my ears deceiving me or is mom talking about cats? Cats are our favorite. 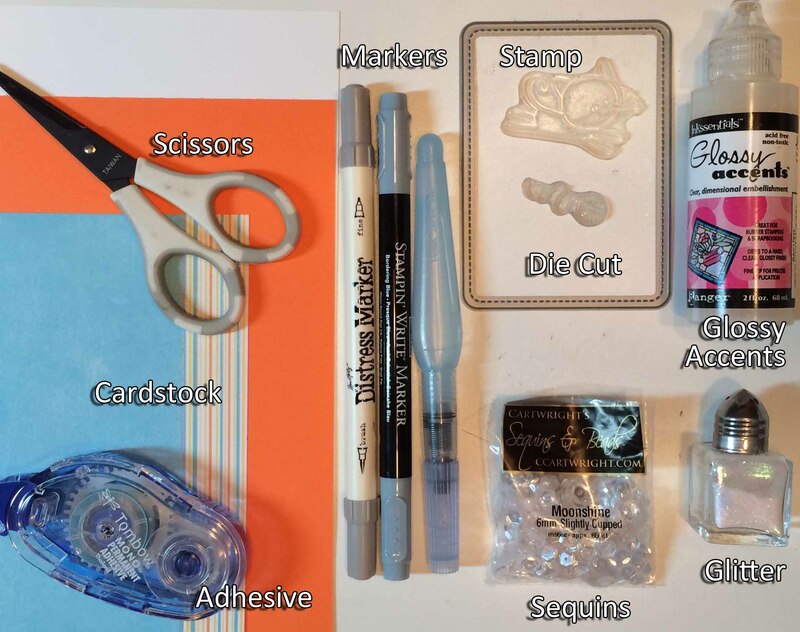 This entry was posted in 31 Days of Cards, Accountability, Cards, Challenges and Contests, Goals, Homemade, Paper Crafting and tagged 31 Days of Cards, accountability, Cards, Challenges and Contests, homemade, paper crafting. Bookmark the permalink. I have to say it – this card is pawesome! This one is so cute, I love how creative you are.